Oh Copysoft, why were you so damn lame??? Hi SquallStrife, did you see the trivia on mobygames for the Skunny Kart/Wacky Wheels games? http://www.mobygames.com/game/dos/skunny-kart/trivia Both games are based on the same engine, more or less. rcblanke wrote: Hi SquallStrife, did you see the trivia on mobygames for the Skunny Kart/Wacky Wheels games? http://www.mobygames.com/game/dos/skunny-kart/trivia Both games are based on the same engine, more or less. Hey! Yeah, I saw on Wikipedia that Copysoft did receive a copy of the source code when Beavis Soft was looking for a publisher. But I didn't know that Copysoft actually used that source code, although I suppose it would explain the uncanny resemblance. This week, the Playstation 2 Linux Kit! I was always curious about the PS2 linux kit. Thanks for doing the video; now I know I wasn't missing out on anything important. OKAY!!! 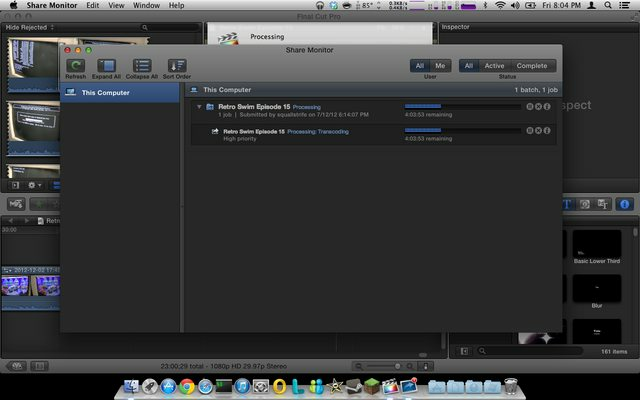 After a near disaster this weekend involving my Laptop's HDD, I commenced editing Episode 11 last night. Should be finished today for uploading overnight. Sorry for the delay folks. I nearly lost about 300 photos from our trip to the USA, so yeah, it kind of took precedent over editing my web show. The good news is that the photos were recovered, so my head's escaped the chopping block this time. Phew. It's here! Episode 11 is live! This week, Sony PocketStation. Get some Oddware into ya! Edit: Oop, looks like it's still processing. Shouldn't be too long folks. Edit: For some reason, the video looks darker on Youtube than it did in Final Cut, also the titlecard somehow managed to un-set the episode number. URGH! I'll re-render and re-upload this episode when I get home tonight. I feel like a bit of a tool! This week, a tour of my PC games collection, and the various computers I have. In this ep, I take a look at how I get files from the Internet or whatever, on to my old computers. Side note, I think this is the only video on youtube containing Prince of Persia with Tandy 3-Voice Music and DAC Sound! SquallStrife: I have just embedded your newest episode (13) two places so I hope you get some views that way, also you could/should (unless you are already a member there), perhaps make your own thread at ASSEMbler, where a lot of shows, have their makers at such as Yakumo, vetz, among others give their news too and if LGR can behave then I think he would love that forum too. As long he points to his youtube side of videos, and not the retroware side even though they are the same videos. So, who likes MDK? If so, you'll like the music in Episode 14, which is rendering now, and should upload overnight. Here, I add a 50/60Hz switch to a Mega Drive 2. Not much more to say, really. Enjoy! Thanks to a generous gift of hardware from DonutKing, there will be an extra episode of Retro Swim before Christmas! Watch this space!! Getting a 386 motherboard up and running, and bringing a multisync monitor back to life, kinda. Enjoyed it! That monitor makes me jealous. you're not the only one who is jealous that is one awesome monitor! Glad that monitor has found a loving home instead of languishing in my garage. Have you got analog input working on it as well? Shame about that 386 board though, looks like it needed a bit more TLC than I thought. Yep, made up a VGA cable after I did the video and it works a treat! The 386 board seems to run most stuff except Speedsys. Not quite sure what's up with it TBH. The voltages seem to be OK, but maybe the PSU has bad ripple or something I cant see with a multimeter, so I'm going to try it with a different PSU later.